Open the Deck Chairs- TEA for the New Year! This is a trustworthy saying. And I want you to stress these things, so that those who have trusted in God may be careful to devote themselves to doing what is good. These things are excellent and profitable for everyone (Titus 3:8, NIV). Then Jesus made a circuit of all the towns and villages. He taught in their meeting places, reported kingdom news, and healed their diseased bodies, healed their bruised and hurt lives. When he looked out over the crowds, his heart broke. So confused and aimless they were, like sheep with no shepherd. “What a huge harvest!” he said to his disciples. “How few workers! On your knees and pray for harvest hands!” (Matthew 9:37-38, MSG). 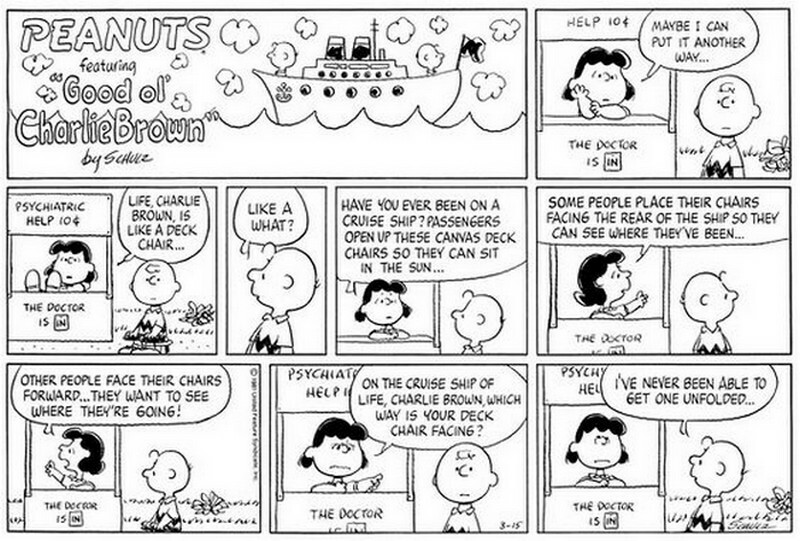 Sometimes we can feel a lot like Charlie Brown. Getting stuck at getting started! It can consume our valuable time, energy, and attention to the point that we end up accomplishing very little, and even more importantly, could end up distressed, or depressed, figuring out the next step! For Charlie, which way his deck chair was facing, finding his place on the ship was secondary to getting the deck chair opened in the first place! Opening our own life’s deck chairs represent how we invest three gifts that God has given all of us to share. And I mean all of us; no matter our age or experience, whatever our talents or interests, or particular cycle of life, or our mobility. The three gifts are our Time, Energy, and Attention. (Think of it as our TEA, for short: Time, Energy, and Attention.) As the New Year begins, take a moment to review how your TEA is tasting! If you have lots of Energy and Attention, but no Time, you probably feel overwhelmed. If you have Time and Attention, but no Energy, you are likely exhausted. Or, maybe you have lots of Time and Energy, but no Attention. If that describes you, then you are probably distracted. But when our TEA is in balance, we can “open our deck chairs” to feeling more energized and engaged. And, we will feel more satisfied in doing good in the community in the name of Jesus Christ! We will find our own unique place on the ship called, Cold Spring Presbyterian Church. God commissioned us three hundred years ago to chart a course for blessing our community in the name of Jesus Christ. Do you need help with your deck chair? Consider the scripture verses above for insight from God’s word about how we can find our place on board. The Apostle Paul wrote the letter to Titus, the New Testament book bearing his name, as a kind of instruction manual for the young pastor. Titus was concerned about what activities the new community of faith should focus on. The believers who met at Titus’ house church on the Island of Crete didn’t just to be busy. They wanted their Time, Energy, and Attention focused on the right priorities. Loving and glorifying God. Serving others. So Paul stressed— devote yourselves to doing good! That’s Titus’ bottom line as he followed Christ, and how Paul wanted every ministry and activity to be evaluated. Was it good for others? Did it accomplish good, or not? If so, do more of that. And if not, then stop doing that! Jesus’ words inspire us to get involved in this New Year. He said, “What a huge harvest! How few workers!” When we look at the greater Cape May community of neighbors, friends, and family, do we see opportunities? Well, God does. And God has invited Cold Spring Presbyterian Church to “open our deck chairs” and do good! There’s work to accomplish. Love to demonstrate. Service to offer. Like it was said of Jesus who reported kingdom news, and healed their diseased bodies, healed their bruised and hurt lives. Proclaiming the Good News about Jesus requires us to do good. To bless others. To respect others. To welcome everyone. Once we figure out where we put our “opened deck chair” we will know how we fit in, join in, or serve by investing our Time, Energy, and Attention better. Some of us want to celebrate where we’ve been. We have lots of experience. That’s great. You would be a great encourager, prayer warrior, or contributor, and your source of wisdom can help us move forward. Or, perhaps you are called to face forward and help to set the course, grow, and help the ship bring its gifts to the community. Our communities and neighborhoods deserve hope and wellness of mind, body and spirit. Cold Spring Presbyterian Church has the spiritual resources to do even more good in 2019. Will you consider your TEA this week and ask God how to best invest your Time, Energy, and Attention. Get those deck chairs opened and get ready, “striving what lies ahead” (Philippians 3:13). I think 2019 is going to be an amazing adventure in our 305th year of doing good in Jesus’ name. Get your TEA ready! All aboard!